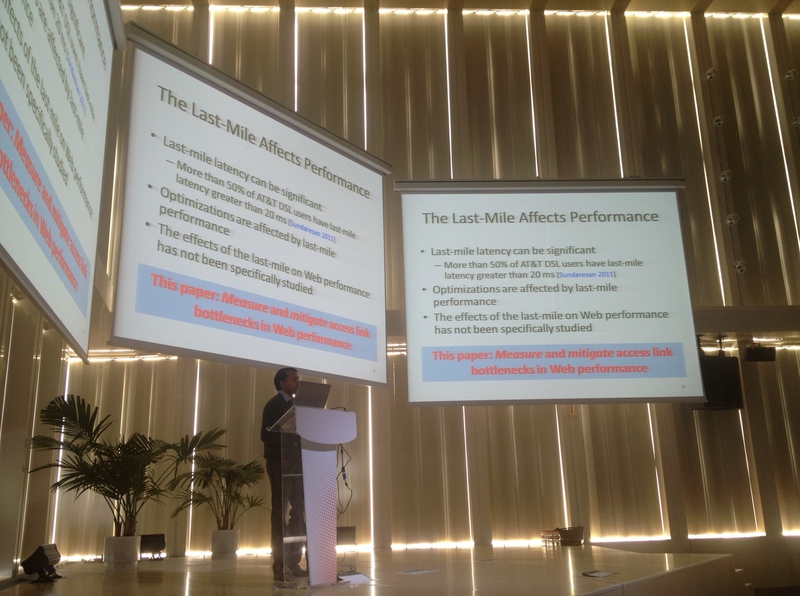 Congratulations to Srikanth Sundaresan, whose paper “Measuring and Mitigating Web Performance Bottlenecks in Broadband Access Networks“, was selected for the Community Contribution Award at ACM SIGCOMM Internet Measurement Conference. The research uses the BISmark home network measurement platform which he and others have developed and deployed in more than 200 home networks around the world. When the downstream throughput of the access link exceeds about 16 Mbits/s, latency is the main bottleneck for Web page load time. Placing a cache in the home network and performing active prefetching for DNS records and TCP connections can improve Web page load time by as much as 35%. The paper was selected for the award based on the importance of the research findings and the value of the software and data to the broader networking community. Congratulations to Srikanth!